Heart Story, is a journey that Alpha takes to break through his own suffering. He encounters three mystics in his quest, namely Lalla, a Dervish-Woman, Lao Tzu an Inter-Galactic Sage and Nasrudin the Witty Metaphysical Doctor; while Rumi comes over at the last phase of Alpha’s metamorphosis. Shams, Tolstoy, Tagore, Carl Jung, Goethe, Emerson, Mark Twain, Ibn Arabi, Jiddu Krishnamurti, Hafiz, Omar Khayyam, Khalil Gibran, Hallaj, Rabia, William Blake, Swami Vivekananda, Ghalib, Meister Eckhart, Joan of Arc, George Bernard Shaw, Bulleh Shah, Moses Maimonides, Hermes Trismegistus, Albert Einstein, John Lennon including others appear as apparitions in the background playing their roles as archetypal soul guides. These mystics take Alpha through many parallel world’s revealing Zen Koan’s, Sufi Parables and meta-visions of transcendental consciousness, breaking away the limitations of mental intelligence and simultaneously causing a big bang that the author calls Heart Intelligence. Messengers of peace and compassion from diverse faiths, come over briefly to express the original message of unabridged love and the beautiful power of human creativity and unity. They communicate a subtle message of seeking a common denominator between all the great faiths and traditions of the world. The play of seers and sages work as a tumultuous odyssey packed with passion, compassion, wit, humour, adventure and what the author so aptly refers to as “Heart-metamorphosis via Heart Intelligence”. This is a gallant attempt by the author to embalm some solace at the seemingly mission impossible predicament of human existence! 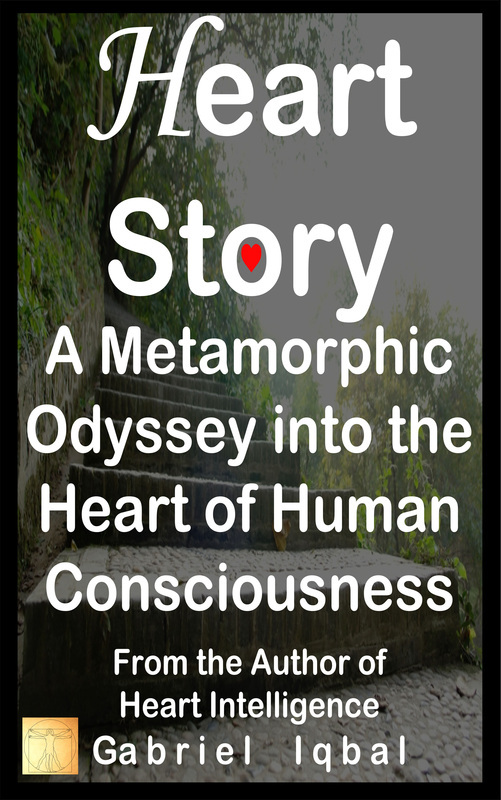 This story adds a vivid human journey to the masterpiece work, Heart Intelligence – Book Trilogy and Film, by the author. 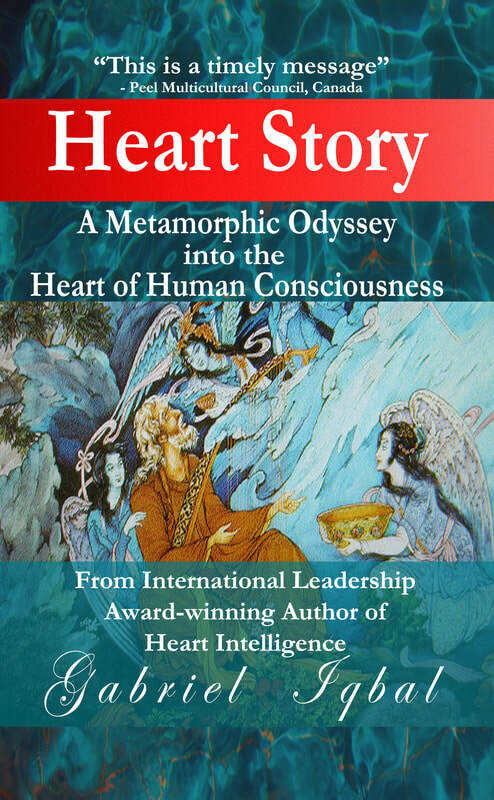 Award-winning sustainability training specialist and internationally acclaimed Biologist, Poet and Humanitarian, Gabriel Iqbal, dives into the heart of self-realization, via a literary odyssey, fittingly called, “Heart Story”, that has the gem like capacity to initiate and illuminate into a powerful consciousness the darkest recesses of the human soul. Mystical wisdom holds the simple and beautiful notion that there are as many interpretations as stars in the sky. Like the stars Heart Story has myriads of unlimited fresh perspectives and interpretation's, it is not the pursuit of a canonical meaning. When you read this story, I implore you to see yourself reflected within the story and make your own interpretations rather than rely on the story to tell you the meaning of the story. In this manner, “if you let it”, you will transcend your mind and undergo what the mystics call, metamorphosis of the heart, as the myriad perspectives of the story's consciousness evoking and underlying intuitive Heart Intelligence will lead you to – unlimited possibilities…!